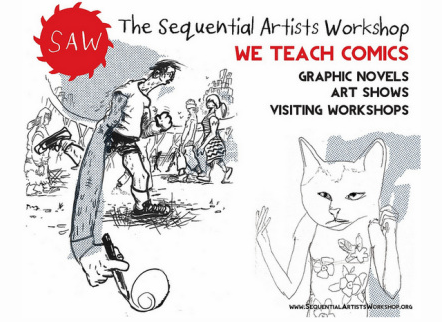 Tom Hart runs the Sequential Artists Workshop or SAW, a school for cartooning and graphic novels in Gainesville, Florida. We feature a year-long intensive program, week-long programs and online consulting. Click below to learn more. Hello! from the Sequential Artists Workshop, or SAW. A couple years ago we had the crazy idea to open a school; an informal, but serious school, with a curriculum to match any anywhere, but without the baggage, the loans or the politics of higher education. This was the challenge: to create an outpost of support and learning in the comics world. We’re here to educate students and support artists. SAW is a place you can come for a week or a year and forge your personal creative path in visual storytelling. We Teach Comics!We’ve taught comics to youth, adults, newcomers, to visiting students, and to artists and writers in other fields. And we’re proud of the amazing education we’re offering to our current full-year students, who are getting an excellent, full-time, intensive education in drawing, writing, reading, applied media, experimental projects and all things sequential art. SAW is a place like no other in the American comics world right now.We offer a fully functioning two-leveled studio; a stocked library of inspiration, reference and history; a risograph printing station; and first-rate instructors full of knowledge, talent, experience and generosity of spirit. Study Comics. Make Comics.Our students in 2012-2013 made hundreds of pages of story and artwork, co-curated more than a dozen art shows, collaborated with dramatists and comedians to create original theater, printed and bound thousands of copies of books, attended festivals; worked for clients; and learned in close proximity from our staff of working artists. “I’d say I left SAW feeling like I got so much more than I expected or understood I would get. I got a deep, personally catered fine art education in the fundamentals that can push my own work and style forward.”- Jared Cullum, week-long participant. Read about our Year-Long Program HERE. Our Visiting Artist Workshops HERE.